If that headline made you go back and do a double-take, chances are that you join most wine lovers in characterizing Chardonnay as a rich, buttery, oaky and full-bodied kind of white wine. For many Chardonnays, particularly New World bottlings, it's a fair assertion, describing a style of wine that divides the world into two groups of people: Those who love Chardonnay and those who'd really rather have something else, thanks. But for every rule there are a few exceptions, and this is certainly true here. The original Chablis from France, near Europe's northern edge of wine cultivation, is usually lean, tart and stony, rarely showing evidence of oak. Macon and its neighbors on the southern end of Burgundy can be light and crisply styled; and you'll find the occasional "unoaked" Chard checking in from New Zealand and Australia, too. Today let's turn to Washington State for a reasonably priced Chardonnay that's light in weight and easy on the wood, with only a hint of spicy French oak showing up as an accent in its crisp apple and pear flavor. 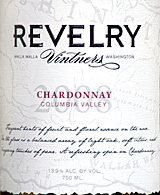 Revelry Vintners 2008 Columbia Valley Chardonnay ($13.99), according to the winery, is aged at cold temperatures in flavor-neutral stainless steel tanks for 18 months, during which time "we also expose the wine to 100% French oak for four months." That's a bit vague, and very likely does not refer to barrel aging but the placement of barrel staves, perhaps, or even oak chips in the fermenting tanks. No matter: The result is in the tasting, and this is a pleasant wine. Curiously, Revelry offers the Chardonnay both in standard 750 ml glass bottles and - get ready for it - in magnum-size "casks," better know as "wine-in-the-box." If you're inclined to diss boxed wines, it might pay you to give the bottled version a try. Assuming it's the identical product, you'll find nothing second-rate in this bottle. Well-balanced and food-friendly, crisp and tart, it speaks more of fruit than oak. There are two good reasons for following the decanting ritual. Not every wine should be decanted, but some need to be. Taylor explains the ins and outs of the procedure. Not all restaurants embrace BYO, but in cities and states where the law permits, increasing numbers are okay with it – provided you follow the rules. If you enjoy The 30 Second Wine Advisor, I expect you'll like Taylor's Email wine letter, too. Sign up on the front page of her Website, TaylorEason.com. 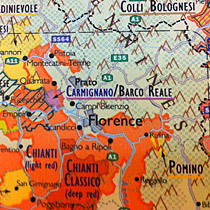 FOOD MATCH: The wine's light, fresh fruit and snappy acidity go with fish and seafood like a squirt of lemon. It was fine with an Italian-style dish from Marcella Hazan, roasted bluefish stuffed with capers and anchovies, breadcrumbs and Parmigiano. VALUE: A reasonable buy in the middle teens. Wine-Searcher.com offers limited vendors for Revelry Chardonnay." The 2007 vintage is available for sale direct from the winery for $14.99 at this link, available where the law allows.